Structural Biology aims to describe how biological systems work at atomic resolution. The gap between biochemical and genome data on the one hand, and complex structures on the other, is still huge. However, current research seeks to develop technological improvements to characterize large complexes and to facilitate their resolution at atomic scale. Challenges in the field also include studying the dynamic processes required for the correct function of signalling networks. The final goal is to apply our molecular understanding to decipher the keys that determine the complexity of biological processes and potential sites of vulnerability. In this Barcelona BioMed Conference we plan to combine presentations on Genome-wide and Systems Biology approaches with advances in Structural Biology applied to complex systems. Recent developments in these fields will be discussed by speakers and participants from diverse backgrounds who share an interest in understanding and visualizing protein function in health and disease. 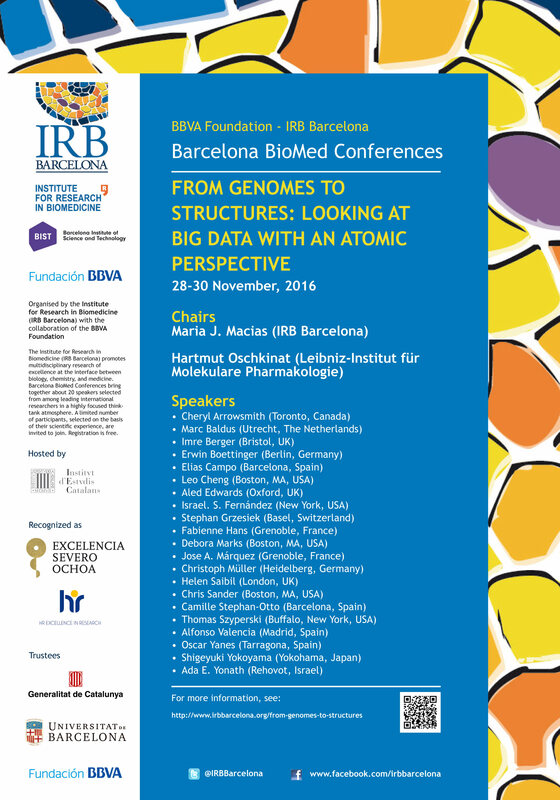 The BARCELONA BIOMED CONFERENCE on From genomes to structures: looking at big data with an atomic perspective will be hosted by the Institut d'Estudis Catalans (IEC) in the heart of downtown Barcelona. Talks will take place in the Sala Prat de Riba.